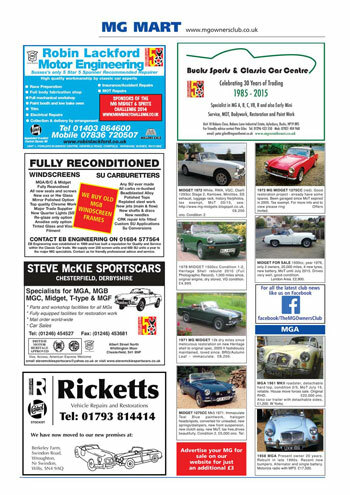 Thank you very much for your interest in advertising in The MG Owners’ Club magazine, Enjoying MG. Enjoying MG is a 92 page, full colour magazine which finds its way to our 26,000 subscribing members each month. Your advert will also be included in our E-Mag, which is online and accessible to members, for the duration of each month. Lineage adverts are priced at 75p a word and 80p for any words in Bold. For a photo or logo to go alongside the wording, we charge an additional £5. Display advertising is priced from £72* plus vat. For a full list of prices or to place a Trade Advertisement please email advertising@mgownersclub.co.uk or phone 01954 231125 for more information.